I think this is a very underrated little horror film even among Roger Corman's own directorial output. 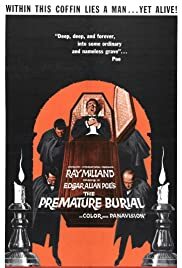 This stems, perhaps, from the fact that Ray Milland steps in for Vincent Price here, making it the odd one out among the series of Corman's Poe adaptations. Ray Milland must have seemed a rather offbeat choice at the time given his reputation of being one of Hollywood's most charming and debonair leading man. In hindsight, however, he gives the role of the paranoid and cataleptic Guy Correll a wounded vulnerability which Vincent Price would have had trouble in bringing out (without resorting to camp). This is evident when one compares two similar roles played by Price in PIT AND THE PENDULUM (1961), in which he overdid the fainting bit, and his later, admirably subdued performance in THE TOMB OF LIGEIA (1964). To his credit, Milland - who was at his best in such light but sophisticated comedies as EASY LIVING (1939), ARISE, MY LOVE (1940), THE MAJOR AND THE MINOR (1942) and KITTY (1945) - did not consider such roles as being beneath him and consequently gave them his all. As a matter of fact, he considered his subsequent role for Corman, that of Dr. James Xavier in X  THE MAN WITH THE X-RAY EYES (1963), to be his second best after his Oscar-winning turn for Billy Wilder in THE LOST WEEKEND (1945)! I sure would like to get a chance to see Ray Milland in his three other notable 'horror' films: THE UNINVITED (1944), ALIAS NICK BEAL (1949) and (directing himself) PANIC IN YEAR ZERO (1962). As for the film itself, I admit that having just watched PIT AND THE PENDULUM, PREMATURE BURIAL and (fairly recently) HOUSE OF USHER (1960) in quick succession, the repetition in the story-lines (catalepsy and premature entombment), not to mention in the art direction (recycled sets), does tend to get rather tiresome. Nevertheless, PREMATURE BURIAL, while perhaps not among Corman's best work, is engaging enough to repay repeated viewings (this has been my third time round).